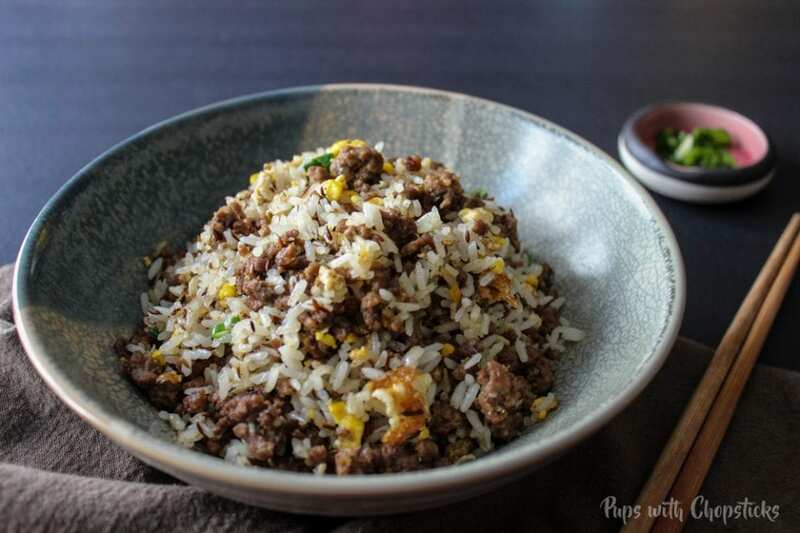 This cumin beef fried rice was inspired from a Turkish breakfast that I used to love snacking on for lunch. My memories of Turkish breakfast consisted of a few fried eggs, some fried Sujuk (aka Sucuk) which is a very garlicky cured sausage (or in some cases Doner!) served with bread and a few slices of tomatoes. 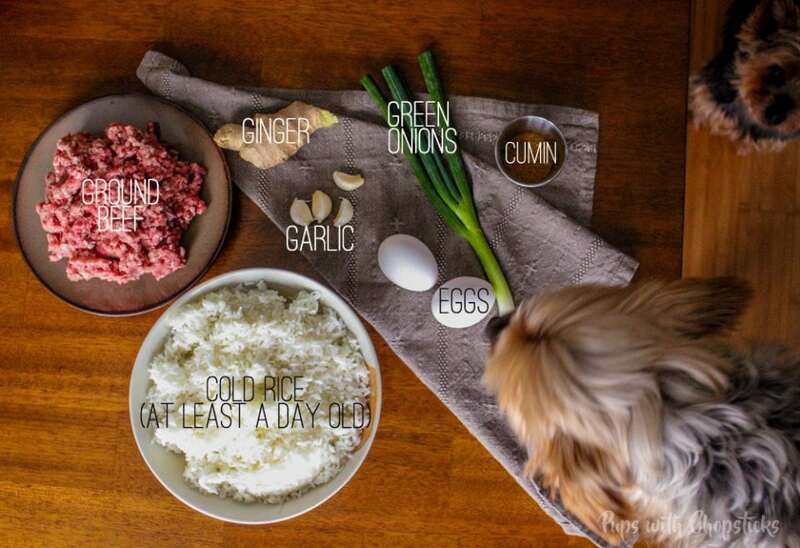 All ingredients for this cumin beef fried rice can be found at the local grocery stores. 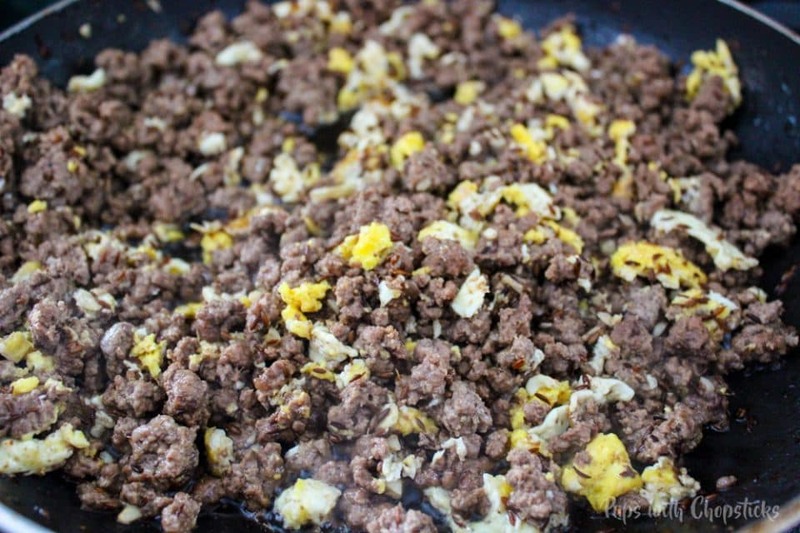 This can be made with ground lamb as well! **Note** I didn’t include sumac in the photography, but if you can find it, I would definitely add 1 teaspoon of it into the fried rice. To make fried rice, always use cold, day old rice. The reason to this is because freshly cooked rice is very soft and fluffy and full of moisture. If you were to fry freshly made rice, your rice would turn out gluey and very wet. Not very good eats when you have gluey wet fried rice. Cold rice on the other hand is more dry, and firm. It can withstand the heat better. The result would be fried with with a more dry texture but a texture where you can see every individual grain of rice and not gluey. To flavour this dish, I add the spices and salt to the meat and not the rice. 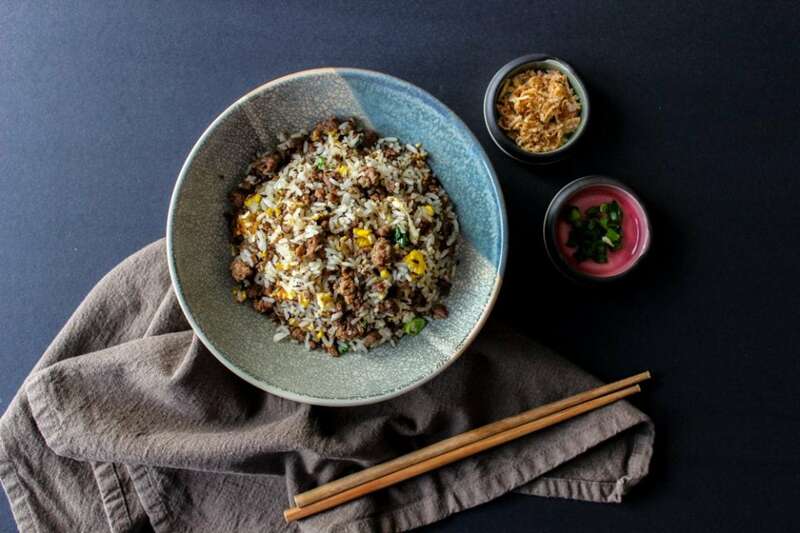 The oils and grease from the meats help the spices and salt spread out more evenly which makes the fried rice evenly flavored. I found that when I added the salt and spices on the rice, it would clump up and stick to one particular area of the rice so you come out with a more patchy spiced and salted rice. Tip #2: Toast the spice! It brings out the flavour and nuttiness. But be careful not to over toast it, spices burn quickly! 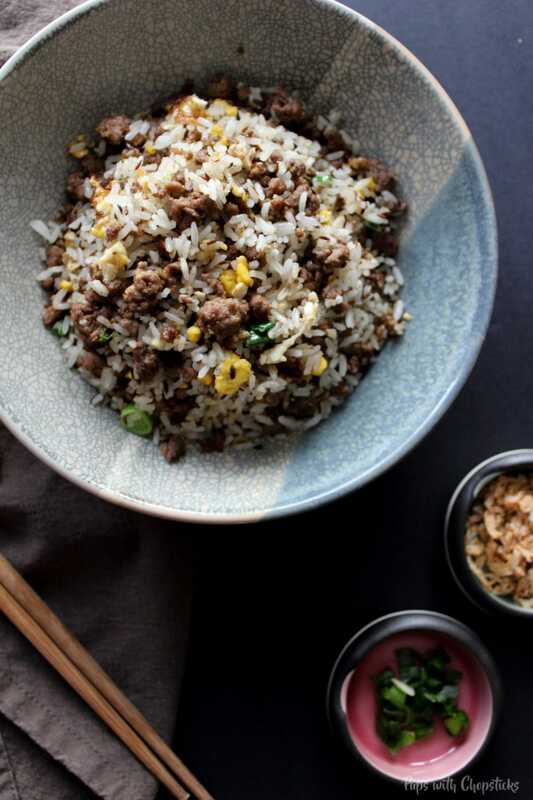 Tip #3: Pre-break apart your cold rice before you start making the beef fried rice. It’s a lot easier, and it’s a lot less messy to do it ahead of time in a bowl instead of breaking it up over the pan. I find the best tools for this is your hands 🙂 just grab a hunk of rice and gently squeeze it, it should break apart in your hands. 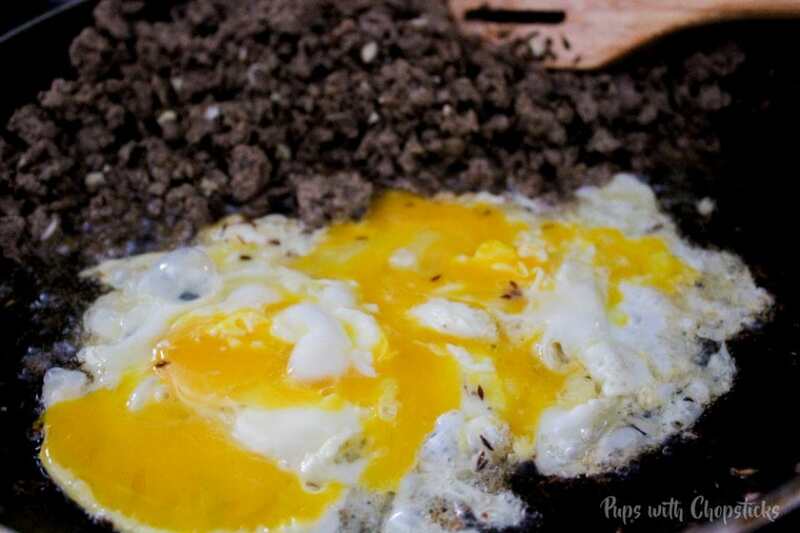 Tip #4: If you find that your fried rice is too dry, you can sprinkle a bit of water over it during the frying. Sprinkle a little at a time, you can add more later if it’s not the texture you want but you can’t take out the water if you put too much. 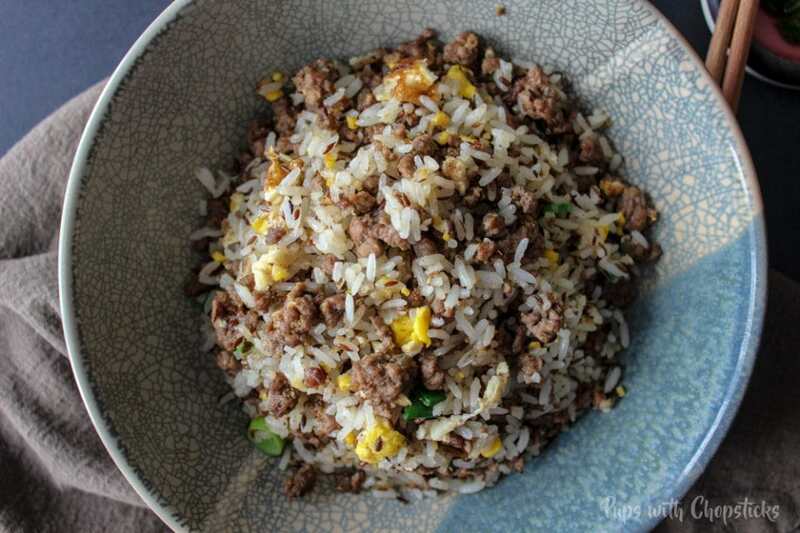 Quick & easy beef fried rice with egg fried rice and cumin ground beef. Great on it’s own or with a side of hummus! Add in the cumin and toast it for 30 seconds. Watch it carefully to make sure it doesn’t burn! Add in the ground beef. Break up the meat into tiny pieces and cook for about 5 mins or until the beef is fully cooked. Add in the rice. If the rice is not broken up into smaller pieces, break it up now and cook for 10 mins constantly mixing the rice into the meat and spices until they are evenly mixed. Turn off the heat, and add the green onions. Add the salt into the meat and not the rice, the grease from the meats spreads out the salt more evenly. Salt added to the rice tends to clump into one area. Toast your spices for a more robust and nutty flavour but be mindful of how long you do it for, it burns quickly! I love cumin + beef and cumin + lamb. Great flavours. Combine that with yummy fried rice and you’ve got yourself a delicious treat. I’m heading over now! 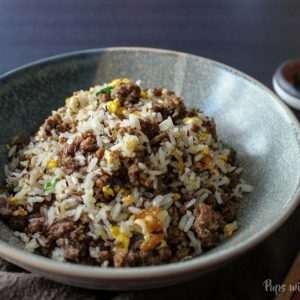 I love adding cumin to ground beef dishes – this sounds like such a different flavor combination for me, and something I can actually make here at the house with my limited kitchen. Thanks!